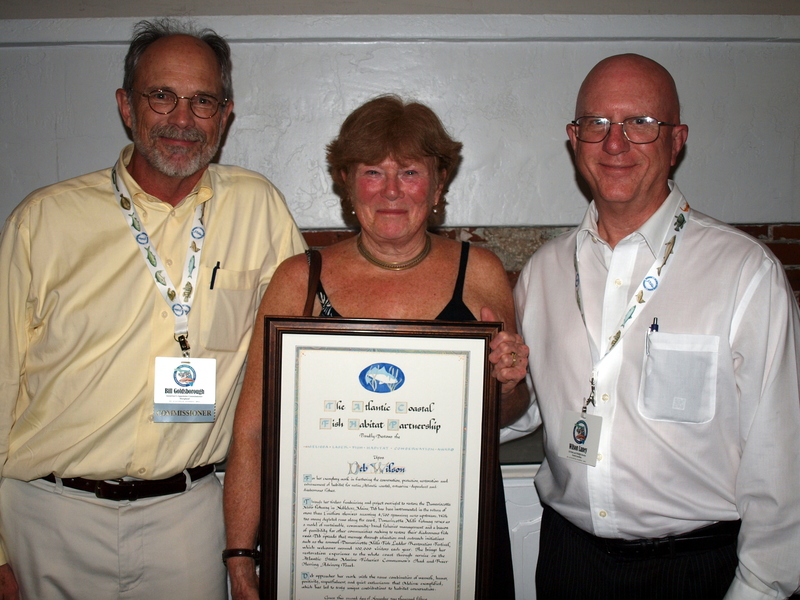 Mrs. Deb Wilson was presented the 2015 Melissa Laser Fish Habitat Conservation Award by the Atlantic Coastal Fish Habitat Partnership (ACFHP) for her exemplary work in furthering the conservation, protection, restoration, and enhancement of habitat for native Atlantic coastal, estuarine-dependent, and diadromous fishes. The award was presented at the 74th Atlantic States Marine Fisheries Commission Annual Meeting Welcome Reception in St. Augustine, Florida on Monday, November 2nd. Through her tireless fundraising and project oversight to restore the Damariscotta Mills fishway in Nobleboro, Maine, Deb has been instrumental in the return of more than 1 million alewives accessing 4,700 spawning acres upstream. With too many depleted runs along the coast, Damariscotta Mills fishway serves as a model of sustainable, community-based fisheries management and a beacon of possibility for other communities seeking to restore their diadromous fish runs. Deb spreads that message through education and outreach initiatives such as the annual Damariscotta Mills Fish Ladder Restoration Festival, which welcomes around 100,000 visitors each year. She brings her restoration experience to the whole coast through service on the Atlantic States Marine Fisheries Commission’s Shad and River Herring Advisory Panel. The award was established in memory of Dr. Melissa Laser, who was a biologist with the Maine Department of Marine Resources, where she worked tirelessly to protect, improve and restore aquatic ecosystems in Maine and along the entire Atlantic Coast. Dr. Laser brought her smiling dedication and enthusiasm to the Atlantic States Marine Fisheries Commission’s Habitat Committee and Atlantic Coastal Fish Habitat Partnership’s Steering Committee. Her contributions to these committees and to her home state were tremendous. Deb approaches her work with the same combination of warmth, humor, positivity, respectfulness, and quiet enthusiasm that Melissa exemplified, which has led to truly unique contributions to habitat conservation. From left to right: William Goldsborough, Deb Wilson, and Dr. Wilson Laney (2013, 2015, and 2012 recipients of the Melissa Laser Fish Habitat Conservation Award).